For the last six years, the 7th grade has piqued the interest of the community in advance of Peace and Publishing Day, the day they illuminate the lives and achievements of the men and women who have worked toward world peace, as well as have a chance in the spotlight to share their own writing. History and Social Studies Co-Chair Anthony Shaker has helped students understand the history of the prize and its evolution since 1901. Each student chose a laureate to research and prepared a “product,” a way for the rest of the grade to see the accomplishments of this broad array of Nobel winners. The 7th graders presented their final products on Thursday afternoon at the Nobel Peace Prize Museum. When they weren’t docents in the museum, the 7th grade provided both audience and performers with readings of their poetry and selections from the recently published anthology of short stories, Clark Street Stories. We have published 12 volumes of 7th grade writing, and this year’s volume holds the record for number of pages and variety of protagonists. These stories went through multiple drafts and revisions and are all linked through characters and location. When the Parker slam poetry team competed at this year’s Louder Than a Bomb poetry festival, they struck up a friendship with one of the teams in their slam bout: Phoenix Military Academy in East Garfield Park. The teams found mutual respect in their poetry, and Parker invited Phoenix to be part of this year’s slam poetry Morning Ex in May. Last Friday, those poets shared the stage in what turned out to be an amazing display of poetry, performance and camaraderie (it’s not every MX that gets a standing ovation). Afterward, the poets shared lunch and walked around the school together, and they even sat in on a prom ask. These types of connections between schools across the city is what Louder Than a Bomb is intended to foster, and Parker’s poets hope to have started a new tradition. 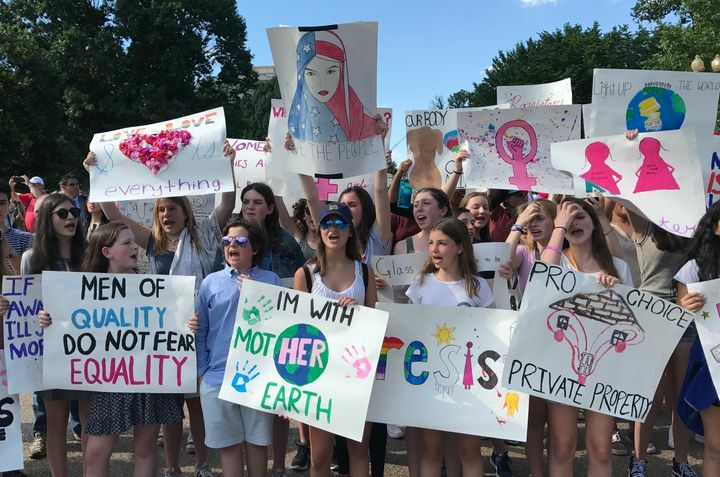 Each year the 8th grade descends on Washington D.C. with a packed three-day itinerary of things to see and do, from museums to monuments to baseball games. This culmination to a year of study and growth is one of the highlights of 8th grade. This year, some new activities during the trip included an inaugural visit to the newly opened National Museum of African American History and Culture, a sit-down meeting with Supreme Court Justice Elena Kagan after a private courtroom lecture and a tour of Senator Tammy Duckworth’s office followed by a meeting with her staff, including Parker alum Aline Sredni ’13, in the Senate Hearing Room. While these were engaging and incredible opportunities for learning, it was a student-driven activity that may be the most lasting takeaway from the trip. After a moving visit from Congressman John Lewis in early May, students were motivated to do some speaking up of their own, so after organizing ideas and creating signs prior to the trip, the grade converged on the White House for a peaceful stand-in, singing “Change Is Gonna Come” and expressing their concerns through call-and-response chants. It didn’t take long to draw a crowd, including news cameras, journalists and other supporters who joined in. This powerful experience was a strong reminder of what membership in democracy looks like and that not having a vote doesn’t mean not having a voice. Oh, and they made the local ABC News and Huffington Post while they were at it. The research process culminates in year-end public events that showcase students’ questions, findings, action and leadership. These events offer important opportunities for Parker students to, as Principal Dan Frank urges us, “bring the outside in and the inside out.” Not only are students researching and presenting on important civic questions, they are also learning from their Chicago peers through the projects they present at these events. Three sophomores—Sarah-Jayne Austin, Audrey Shadle and Alexandra Takoudis—were finalists and went on to compete at the Chicago Metro Fair. Sophomore Felicia Miller received an honorable mention. Sarah-Jayne wrote about female activism in Great Britain and Illinois at the turn of the century; Audrey compared the careers of Touissaint L’Overture and Barack Obama; and Alexandra wrote about the Comfort Women of South Korea. The CMHF website features the students and their projects, along with student winners from schools throughout Chicago. Ms. Elliott supported Parker students’ involvement as well as the whole Metro History Fair process by serving as a judge. Thanks to Ms. Elliott and her students, Parker was able to be part of a significant civic process of history-making. Sophomore Carlos Lopez and Junior Karoli Esparza presented about their efforts launching LASO, Latin American Students Organization, and invited students from other schools to join them in LASO activities and campaigns.. Grace Buono and Maya Sanghvi presented on behalf of the 11th grade Civic Lab group “Migration Stories,” with a focus on Expanded Sanctuary in Chicago. They gathered signatures on the Welcoming Cities Ordinance petition. Congratulations to the student activists, scholars and leaders who participated in these and other powerful civic events in Chicago! On Tuesday, May 23 the Chicago Cultural Center was hosting the annual Mikva Challenge Action Civics Showcase, so colorful poster boards fill the jam-packed room on East Washington Street in Chicago. One yellow board’s heading read, “Bringing School Spirit to Roosevelt” while another red trifold poster was decorated with bubble letters that spelled out “Technology for All.” Students all across the city stood by their boards as peers, volunteers, and judges floated through the poster maze. For the past 15 years, the Mikva Challenge has hosted the Showcase for students from all around the Chicago area to present their projects about current civic issues that interest them. This year, two groups of Parker students presented their Civic Engagement projects. Junior Karoli Esparza and sophomore Carlos Lopez presented about the Latin American Student Organization (LASO) at Parker, and juniors Grace Buono and Maya Sanghvi presented their Civic Lab project about U.S. Immigration on federal and community levels. The Mikva Challenge’s main goal, according to their mission statement, is to “develop youth to be informed, empowered, and active citizens and community leaders.” They do this by providing students with opportunities to get involved with issues from local to federal levels. Students take the work they do in classes or in school clubs and then present to other students, civic leaders, politicians, and business leaders, for one big “science fair of social justice,” as Upper School History Teacher Jeanne Barr puts it. Abner Mikva, the organization’s founder, was an American politician from Hyde Park whose accomplishments include having served five terms in Congress, advising President Bill Clinton, and being Chief Judge to the U.S. Court of Appeals for the District of Columbia. Two of Mikva’s grandchildren, Rebecca and Jordan Cohen graduated from Parker in 2005 and 2008, respectively. Buono and Sanghvi’s presentation covered what Buono’s Civic Lab did throughout the year, such as meeting with the U.S. Immigration and Customs Enforcement (ICE), going to the Chicago Immigration Court, and following the activism that’s taking place with sanctuary cities. As part of Buono and Sanghvi’s presentation, a petition was passed out that asked for expansion of sanctuary in Chicago. A sanctuary city is a city “that limits its cooperation with the national government effort to enforce immigration law,” according to Wikepedia. Video clip and article from HuffPost here! Inspired by the recent presidential election, a group of students, led by student activist Natasha Lerner, are hosting a benefit concert at Metro on Friday night. NBC 5's LeeAnn Trotter reports on the student's efforts. Baring and Draheim so lack confidence that they will inherit a healthy planet that they are suing the United States government for failing to adequately protect the Earth from the effects of climate change. Three students from Francis W. Parker School in Lincoln Park, Priscilla Roman, Karoli Esparza and Chloe Wagner, tell You & Me why it's important to get involved in the Women's March and be a voice for the youth. January 3, 2017 (Chicago, IL) — As part of a national and statewide movement, the Women’s March on Washington – Illinois Youth Chapter will join thousands of other people in Washington D.C. on January 21st, the day after the inauguration of President-elect Trump, to stand in solidarity against the hateful rhetoric of this past election cycle.